This Travel Melbourne page is probably the most important one on the website as it'll allow you to make your way around quickly and efficiently as long as you do your homework beforehand! ........and since 1st January 2015 all other trams within the Central Business District (CBD) and Docklands area are free too!!!. .......Using these services you'll be able to easily reach over 95% of the attractions listed on this website. 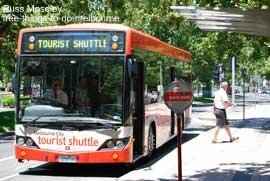 These are great services which both locals and tourists can travel Melbourne on. .....Do they use that saying in Australia by the way? If not, it means 'She'll be right, mate'! 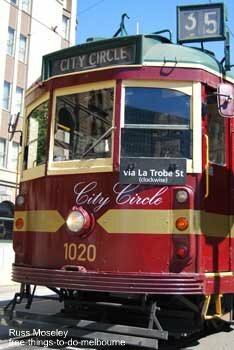 ......This tram route is known as the City Circle. 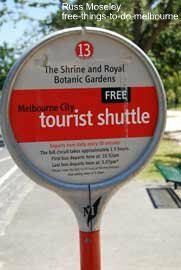 There are 29 tram stops which is plenty to reach all the city centre Melbourne tourist attractions easily. ......Trams run in both directions every 12 minutes or so between about 9.30am and 9pm Monday to Saturday and 9.30am to 6pm Sundays except Good Friday and Christmas Day. The tram has steps as it's the old fashioned type so it can make travelling with a pram a little complicated. I managed it however so you can too - (only take a pram if you do have kids though!). The trams are so frequent there's not really much need for a timetable but if you'd like one click City Circle Tram Route/Timetable. You can also print off a copy of the route map from this site. This free for kids under 10 Visitor Shuttle bus service covers a larger area than the tram route allowing you to easily get to the attractions that are a bit further out of the city centre. There are 13 bus stops with most of the free places to visit within just a short walk of the stops. You can catch the bus every day except Good Friday and Christmas Day although there's reduced service on Labour Day and Anzac Day. They run every half hour starting from 9.30am until 4.30pm with the last bus from Stop 1 leaving at 3.45pm. The last bus finishes back at Stop 1 at 4.30pm. ......It's a good idea to just sit through a complete trip once to get a good look at the city as the tram is often so full you can't get a good view. You can pick up a route map on board or click Visitor Shuttle Bus details and print one off before you go. .........The tram drivers will make announcements when trams are approaching the boundaries of the Free Tram Zone so you'll easily know when you have to get off so you don't get a fine.